Many of the largest professional sporting events, for various financial reasons, can justify the expenses behind a high-end television production operation. However, there’s a tremendous long tail of additional events that are ripe for the picking and ideal for broadcasting. 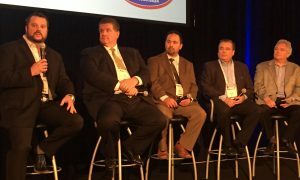 At SVG’s inaugural RSN Summit, executives from regional sports networks and key technology vendors discussed getting the most out of their production budgets on these shows and what new technologies are being leveraged to do so. At-home production has become one of the most prominent ways to cut costs on live event sports productions when the solution is an appropriate one. Robert Carzoli, President and CEO of Program Productions outlines how his company is putting these types of workflows into action. In cases of certain partners, such as the WNBA or MLS, Time Warner Cable Sports has utilized at-home workflows of road games for the Los Angeles Sparks and Los Angeles Galaxy to cut costs on individual productions, thus opening the door for a greater amount of them. Larry Meyers, VP, Content and Executive Producer at TWC Sports outlines the plan. At-home productions certainly save money on travel and personnel but much more is asked of those crew members working the event. Jim Corno, Jr., Executive Producer, Events at Comcast SportsNet Chicago and Carzoli stress the importance of the multifaceted skill sets of production talent. At-home production is certainly a polarizing topic within the sports production industry, but Jason Bernstein, Managing Director of Hawk-Eye North America (A Sony Company) believe a more open line of communication will help crews understand the difference between traditional and at-home production. Not only have at-home production models changed how networks view production infrastructures in their home facilities, but also the on-site complement. Meyers explains why smaller can in some cases be better for live event sports productions. Despite the need to be more considerate of what resources to deploy at a live event, there’s still the demand to produce games at a high level. Corno, Jr. delves into some of the technologies he’d love to see more of on his RSN productions.